Laminate flooring is the perfect option for discerning home owners who would like their floors to be customized to their liking. Laminate flooring is a cost-effective flooring option that is brilliant in design and easy to maintain. A quick look into the designing and creation process will help you make a better decision. This designing software allows you to freely design your floors. Our creative and technically adept designers will assist you in designing floors that astound at first glance. This tool will also give you a mock-up of the final design giving you a fair idea of what to expect. We utilize the process of waterjet cutting to create laminate flooring. Unlike other cutting procedures, waterjet cutting utilizes water and not heat. Thus, there is no fear of the materials warping or getting damaged. Also, this eco-friendly procedure has no hazardous by-products. 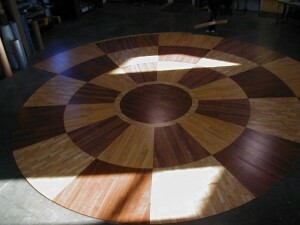 The floor design can be customized, making your design and floors unique and innovative. It is cost-effective in terms of designing, manufacturing, installation, and replacement. Laminate flooring is durable and crack-resistant. Installation is quick and hassle-free. The final look can be mimicked to look like stone or wood. The hassle and cost of real wood and stone can be avoided to get a superior and affordable product. Since the flooring consists of three layers, the top layer can easily be stripped off and replaced in the future. If you are buying a new home or simply looking to replace your old floors, laminate flooring is a simple, cost-effective solution. We customize, design, and create floors keeping in mind the needs of a home owner. This entry was posted in flooring inlays and tagged laminate flooring inlays by Hydro-Lazer. Bookmark the permalink.